No matter how well a transmission is maintained, high heat and friction causes metal to become worn, scratched, and deformed over time. The destruction of the surface layer occurs in high-friction areas, where entire groups of atoms – clusters – may tear off under extreme loads. Until now there was no way to reverse this inevitable metal wear. EX120 starts repairing scratched and worn metal as soon as it is added to an automatic transmission. 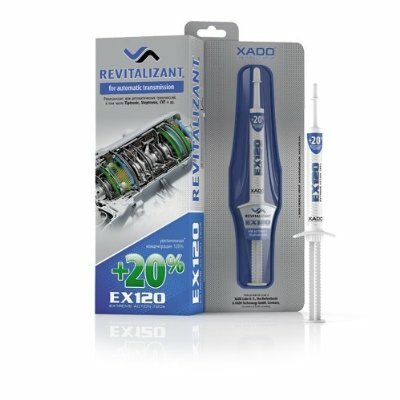 Revitalizant acts as a catalyst for rebuilding and repairing metal in areas of excessive thermal energy. It activates the absorption process of carbon through the surface layer which results in the formation of metal carbides. Application: Ensure the syringe is at room temperature so the contents flow freely. Add the necessary amount of the revitalizant into the transmission fluid reservoir. Drive the car normally. Revitalization is considered to be complete after 50 hours (approx. 1,500 km or 950 miles) of transmission operation.